Remember how I told you book #31 was super smart and also laughoutloud HITYOURHEADWITHTHEBOOK funny? Book #32 was so good I told all my classes and everyone in screaming range that they need to read THIS book. It was kinder, funnier, soooo much more compassionate and wise than I could have imagined. I apologize to the student who lent me this book. I should have read it sooner. I should have read it years ago and passed it on to fifteen people. Why didn't I read this book sooner? I meant to read it first, then I didn't, then I kept pushing it back and pushing it back and reading other books. I know why but I can't tell you. Ok, I'll tell you but it's not true. OK, its true but only so vaguely true that its like the vapor that slips out of your freezer when you open it to peek for ice cream that you didn't buy but maybe just appeared magicalistically. Deep in my heart didn't want Tina Fey's book to be THIS good because that makes her 10% beyond dazzlingly talently perfect, which is both impossible and awesome. In the week I didn't write about this book (but talked about it! ask at least 200 people that have to deal with me!) so awed by a great story by a delightful voice that instead of writing (and imitating her?) I just sat quiet and read three more books and graded a gazillion more sheets of this and that from my students. Saturday morning, a week after I finished the book, I meet an ex-student for breakfast. She's near-perfect, fun, and is connected to Abuela in a way I'll tell you about another day. She's an accounting major, a hard-working, disciplined live-in-the-library and concentrate-until-she-knows-it student who is spending college having a bit less fun that others. That's fine. At the age of 25 she will be out earning me, and people who now beg her to blow of her homework will be coming to her begging for help. It's worth the work. Tina Fey would agree. 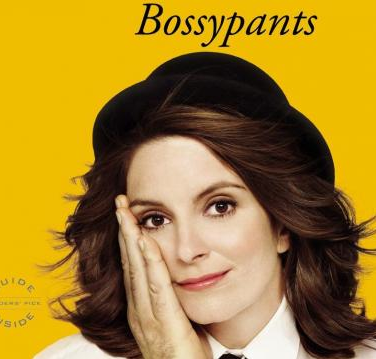 On top of that I tell her - and I'm telling you - that Bossypants is incredibly body-positive, open-minded and and a fun fast read. She doesn't have time to read it but then again, maybe she does. We both giggle at the thought that reading a book is "cheating" on the real work in college. We talk about boys and love and the world. She asks me if I've really read 30+ many books and how I'm juggling it all. The reading is easy. I ignore everyone and sit in a chair and smile. It's the writing that kills me. Soon after that we part. I spend the better part of my weekend not writing about the four complete books I've finished. I grade, I do laundry, I empty out the fridge and fill bags with suspicious mustard etc. Then I think about moving my non-office (which looks like a refugee camp between the kitchen and the dining room table) into the suddenly welcoming and uber-cute laundry room. But first I thought I should move the dining room into the den and get goodwill to pick up that horrible sofa and that recliner that no one wanted and showed up anyway and clearly won't leave on its own. Before all that, I put a chicken in the over and demand to myself that I write this entire review before dinner is ready. I have :52 seconds left.